Uprights (also called frames, or less commonly, legs) are the support columns that hold up individual shelves in a section of rack. Pallet rack uprights form the ends of what are commonly known as 'bays' of pallet racking. 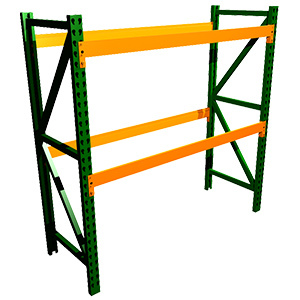 Each pallet rack bay must have at least two uprights, however if multiple bays will be placed in a row they may share uprights (see figure 1 below). Now that you're familiar with the individual components, let's take a look at configuring a rack installation that's right for you. The first step in determining what is needed is to size the product to be stored. The product's width, depth and height are important to know, however you must also include the height, depth and width of your pallet if you are using them (see figure 2). In addition to the size of the product, the maximum weight of the product must also be determined.These measurements are key to determining the correct rack for your needs. Most often, static racks are configured in rows to make maximum use of available space. Rows can be configured in single or double (back to back) runs (see figure 3). The number of rows created will be determined by the width of the bays needed (see figure 1). For example, if the product width is 42" and is to be stored as two pallets per shelf, this is the correct equation: (42+6) x 2 = 96" wide bays. To determine the depth of your uprights, subtract 6" from the depth of the product to allow the proper pallet overhang. For example, if the pallets are 48" deep, subtracting 6" gives an upright depth of 42". This overhang is adequate to insure that the weight of the product will be evenly distributed on the beams however, a lesser overhang is allowable as a function of aesthetics. If this is the case be sure that the pallets are in good condition. In this situation we would also recommend the use of additional supports, such as Pallet Supports or Wire Decking (see figure 5 below). As mentioned above, the beam length will be the exact same as the width of the bays. The length of beams is always measured from the insides of the upright frames. Please note - The top of the upright should be more than 1/2 the height of the pallet + load to prevent loads from tipping over and falling off the rack. The bottom of the top load should never be at the top of the upright. Other items to take into account when determining the overall rack height are the overall height of the ceiling, sprinkler system, lights and any other obstructions. Make sure to also account for the maximum reach of the lift truck that will retrieve the pallets. Also of note when determining aisle width is the turning radius of the lift truck.